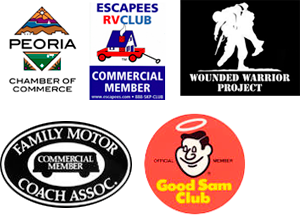 Fix My RV AZ in Peoria, AZ is your go-to stop for all things RV repair and maintenance. From toilet repair and roof top AC systems to AquaHot hydronic heating systems, Fix My RV has you covered. We pride ourselves in quality and knowledge. Our team makes sure to pay attention to ever aspect and detail of your RV to ensure a safe and comfortable trip. We know all things RV, including a little bit of RV history. America’s leading RV historians David Woodworth, Al Hesselbart, and Roger White, all cite 1910 as the beginning of RVing history when the first motorized campers were built. Before this, people camped in spare train cars that were pulled into side tracks. Known as “auto-campers” or “camping trailers,” these classic RVs had none of the amenities or comforts of today’s modern RVs. Those amenities were introduced later in the 1930’s, with beds, dinettes, electricity, and water. The RV industry took off after the 1940’s, post World War II. Americans sought more ability to travel, and thus increased the need for more “high tech” RVs. In the 1950’s, the RV industry was flourishing, with people carting around tiny DIY kits to the large 30 foot models. During the 50’s and 60’s, numerous RV manufacturers started their production, and some are still around today. 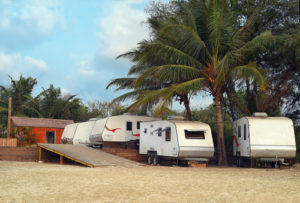 Through the 1970’s and on, advancements in technology and comfort in the RV industry have soared to amazing heights and made the RV industry what it is today. Whatever your RVing trip, whatever your make and model, bring your RV on over to Fix My RV in Peoria. If you’re visiting family for Christmas Cousin Eddie style and need your plumbing checked, we can help. If you’re going on a plush ski vacation and want to make sure your AquaHot system is functioning properly for all your hot showers, we can help. Give us a call today to see how we can help you!